Disclosed are methods of predicting cell response to drug-based therapy using both PCR-Stop assays and real time PCR assays. Methods herein may be used for assessment of drug effect, evaluation of regimen suitability for a given patient, and/or for determination of an optimal drug dose. 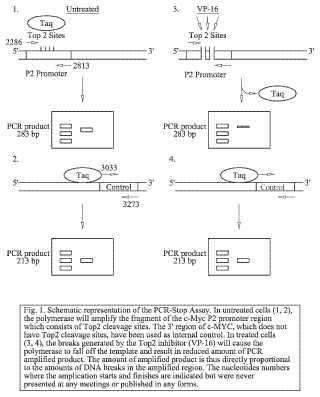 Also provided are isolated oligonucleotide primers such as primers capable of annealing under PCR conditions to a segment of a c-myc locus, where the primers may be used in the disclosed methods. Further disclosed are kits and systems that may be used for predicting a cell response to drug-based therapy.